Supplied as an established plants in 1L pot. Height after 5 years approx. 1m (3ft). 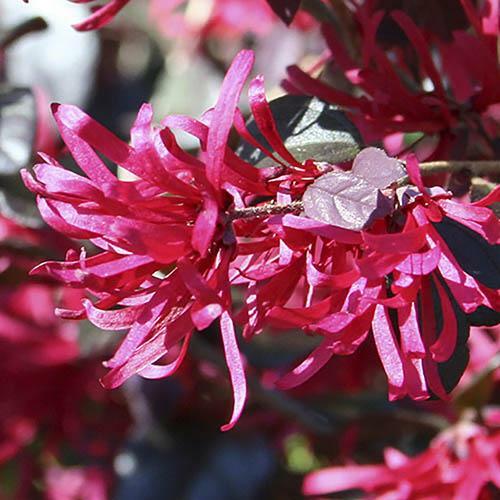 Known as the Chinese Witch Hazel, this new selection 'Black Pearl' has the darkest coloured leaves of Loropetalum cultivars, and still retains the classic Spectacular, Firework-Like Flowers. It is an evergreen - or should we make that ever-purple - giving year round foliage interest. Incredibly exotic looking this highly prized beauty is actually hardy and easy to grow. Its glorious, rich burgundy, oval shaped leaves contrast superbly against any green foliage. Often likened to sea coral, the highly unusual ribbon-shaped petals, explode from the centre just like a firework in early Spring and Autumn, never smothered in flowers, but some are present for many months of the year. Very slow growing, it has a somewhat lax and spreading habit, making it ideal for containers in cooler, shaded spots - but avoid wet feet, especially in Winter.